X-FLARE: Departing sunspot 1402 unleashed an X2-class solar flare on Jan. 27th at 18:37 UT. 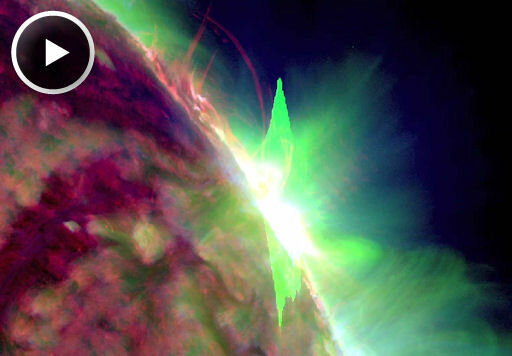 NASA’s Solar Dynamics Observatory recorded the extreme ultraviolet flash. Sunspot 1402 is rotating onto the far side of the sun, so the blast site was not facing Earth. Nevertheless, energetic protons accelerated by the blast are now surrounding our planet, and an S2-class radiation storm is in progress. The explosion also produced a spectacular coronal mass ejection (CME). A movie from the Solar and Heliospheric Observatory shows the cloud raced away from the sun at 2500 km/s or 5.6 million mph. Update: Work by analysts at the Goddard Space Weather Lab shows that the CME will just miss Earth when its edge passes by our planet on Jan. 30-31.